Nebraska facts and history plus travel and tourism information. Located on the central Great Plains, Nebraska is a largely rural state whose land is devoted to agriculture. Nebraska's chief crops include corn and soybeans, while its primary livestock products are beef and pork. Once considered part of the Great American Desert, irrigation systems have dramatically increased the land's arability. Before Nebraska became the 37th state on March 1, 1867, the region's population was dominated by the Missouri, Omaha, Oto, Pawnee, and Ponca tribes. The Oregon Trail was blazed in 1841, but only missionaries, fur traders, and Indian agents initially used the trail. By 1843, westward travelers were following the Oregon Trail through Nebraska. Settlers began claiming land within Nebraska when the area became a territory in 1854, the 1862 Homestead Act offered free land, and railroads arrived in 1865. Tourists enjoy exploring the historical trails in Nebraska and several sites associated with them, namely: Chimney Rock, Scotts Bluff, Homestead National Monument, and Fort Robinson. 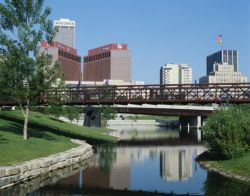 The Toadstool Geological Park and Pine Ridge in the northwest, the Sandhills, and Agate Fossil Beds are also of interest, and Omaha is Nebraska's largest city.